In today’s A Lab Aloft entry, International Space Station Program Scientist Julie Robinson, Ph.D., continues her countdown to the top ten research results from the space station, recently presented at the International Astronautical Conference in Beijing, China. Be sure to check back for daily postings of the entire listing. We’re at the halfway point for my top ten research results for the International Space Station. As we kick off the second portion, I hope you have already learned something new to take home about our amazing orbiting laboratory. 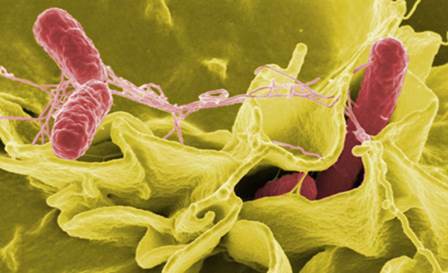 Number five on our countdown is the pathway for bacterial pathogens to become virulent, in this case Salmonella. This is a topic that you may have heard about, because it was published in the Proceedings of the National Academy of Sciences. It has been heavily discussed by some of our stakeholders; the original discovery came from some human research focused investigations. 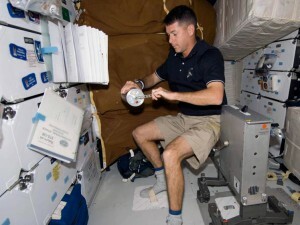 There was some indication from ground research that certain bacteria might become more pathogenic (more able to cause disease) when they went into space, in particular Salmonella bacteria. Salmonella infections results in 15,000 hospitalizations and 400 deaths annually in the United States. Cheryl Nickerson, Ph.D., from Arizona State University proposed to NASA that it may be good to look at this to find out if there was an increased risk for food borne illnesses in astronauts. NASA’s human research program funded the first study to fly these bacteria into space. What researchers found was that the bacteria did become more able to cause this disease. More importantly, however, they identified the genetic pathway that was turning on in the bacteria, allowing the increased virulence in microgravity. This pathway had to do with the way that ions pass through the culture media. In a later study funded by NASA’s space life and physical sciences project, Nickerson was able to fly media that did not have those ions, and then control whether or not that bacteria became more or less virulent. This is a great piece of scientific research showing the importance of doing biology experiments in this unique environment. There was a time when I would have had one of my top results be the possibility of developing vaccines on the ground—a private company did some additional studies in this area on the space station. Developing new medical treatments can take years, though, and have a lot of ups and downs. Right now that doesn’t appear to be developing as quickly as one might have hoped, so the jury is still out on the final benefit. Still, the core discovery here remains significant. 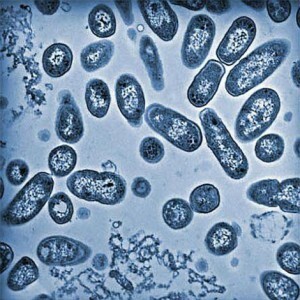 Scientists are working through other species of bacteria now, trying to understand if this is a common pathway. If so, how can we use it to increase or return benefits back to Earth, and can this new knowledge be used to help fight disease? Nickerson and colleagues continue to work on these questions, using the important discovery of this new pathway found through space station investigation.